Sixty-nine fundraisers this year by December 1. That’s an average of more than one fundraiser every five days. (Though, as Obama’s latest Big Apple trip shows, these events are often clustered together on a single day.) This is a blistering pace of rainmaking for the 44th president in 2011. 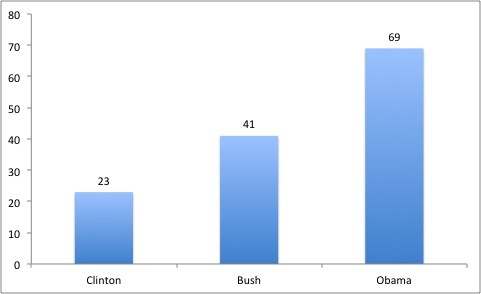 Obama’s fundraising activity surpasses that of predecessors George W. Bush and Bill Clinton. According to Brendan Doherty, a political scientist at the US Naval Academy, Bush attended 41 fundraisers between January 1, 2003 and November 30, 2003. Clinton attended 23 fundraisers from January 1, 1995 and November 30, 1995. Obama’s fundraising has more than paid off. The president has raised nearly $90 million so far—but with a significant 46 percent of it from small donors—for his reelection effort, according to the Center for Responsive Politics. The next highest fundraiser in the 2012 presidential field is Republican Mitt Romney, who has raked in $32.2 million. Obama’s pace exceeds his own fundraising in the early stages of his first presidential run, in 2007. Through September 30, 2007, Obama had raised $80 million; this time around, that figure was $88 million through September 30. As the president, he does have the full backing and fundraising muscle of the Democratic National Committee, which is scouring the country for every dollar and every volunteer it can find to power Obama through what’s shaping up to be one of the most bruising, cash-drenched campaigns in history.